Althea Gibson, a sharecropper’s daughter, entered the world of sports when segregation severely limited opportunities for African Americans. She eventually became the first black athlete to cross the color line of international tennis and golf. Althea Gibson was born on August 25, 1927, to Daniel and Annie Bell Gibson, sharecroppers on a cotton farm near Silver, South Carolina. In 1930 the family moved to Harlem where Gibson’s younger siblings were born. While growing up in Harlem, Gibson played paddle tennis on a section of 143rd Street between Lenox and Seventh Avenues that was barricaded during the day so neighborhood children could participate in organized sports under the supervision of the Police Athletic League. Gibson became proficient in paddle tennis, and by 1939, at the age of twelve, she won the New York City, New York women’s paddle tennis championship. The following year, a group of Gibson’s neighbors took up a collection to finance her junior membership at the Cosmopolitan Tennis Club in Harlem. In 1941 Gibson entered and won her first tournament, the American Tennis Association’s New York State Championship. She later won the ATA national championship in the girls’ division in 1944 and 1945 and after losing the women’s championship final in 1946, she won the first of ten straight titles beginning in 1947. Gibson’s success drew the attention of Dr. Walter Johnson, a physician from Lynchburg, Virginia, who was active in the national black tennis community. He mentored her and helped her gain important competitions with the United States Tennis Association (USTA). 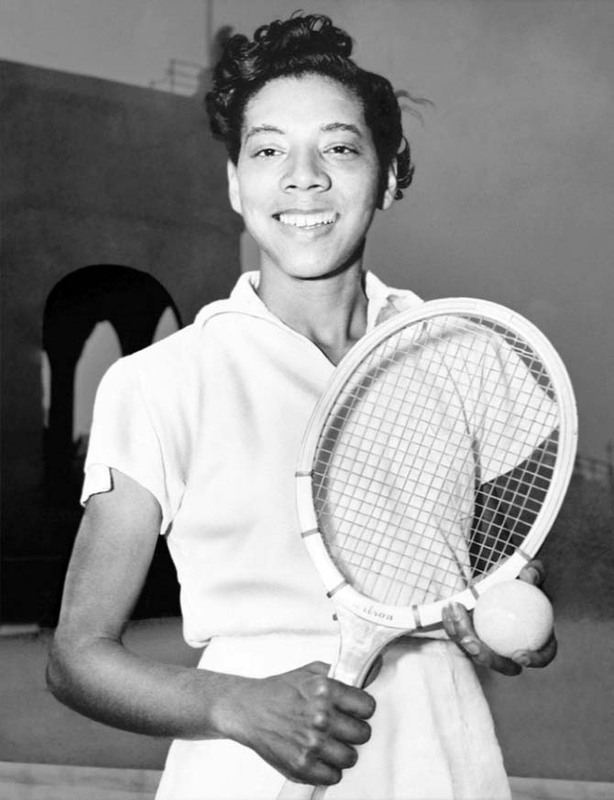 In 1949 she became the first black woman and the second black athlete (after Reginald Weir) to play in the USTA’s National Indoor Championship. Later that year, she earned a full athletic scholarship at Florida A&M University. In 1950 Gibson became the first black player to compete in the United States National Championships (now the U.S. Open) at Forest Hills, New York. Although she lost narrowly to Louise Brough, the reigning Wimbledon champion, the following year she won her first international title, the Caribbean Championship in Jamaica in 1951. After graduating from Florida A&M, Gibson took a job teaching physical education at Lincoln University in Jefferson City, Missouri, but she continued her tennis competition. In 1955 the U.S. State Department sent her on a goodwill tour of Asia. When the tour was over, she remained abroad, winning sixteen of eighteen tournaments in Europe and Asia. In 1956 Gibson became the first African American to win the French Open. Later she won the Wimbledon doubles title with Briton Angela Buxton, the Italian National Championship in Rome, and the Asian championship in Ceylon. In July 1957, she won Wimbledon, considered at the time the world championship of tennis, and received the trophy personally from Queen Elizabeth. She won the doubles championship as well, and when she returned to New York City, she became only the second athlete, after Jesse Owens, to receive a ticker tape parade. In late 1958, after having won fifty-six national and international singles and doubles titles including eleven Grand Slam championships, Gibson retired from amateur tennis at the age of thirty-one. In 1964 after unsuccessful attempts to start acting and singing careers, Gibson at the age of thirty-seven became the first black woman to join the Ladies Professional Golf Association (LPGA) tour. While she broke course records during individual rounds in several tournaments, Gibson’s highest ranking was twenty-seventh in 1966 and her best tournament finish was a tie for second place at the 1970 Buick Open. Gibson was the first African American woman named Athlete of the Year by the Associated Press. She was inducted into the South Carolina, Florida, and New Jersey Sports Halls of Fame, the International Women’s Sports Halls of Fame, and the International Tennis Hall of Fame. She was also among Sports Illustrated’s Top 100 Greatest Female Athletes. On September 28, 2003 Althea Gibson died at the age of seventy-six in East Orange, New Jersey. “Althea Gibson,” in Women’s History, http://womenshistory.about.com/od/gibsonalthea/a/althea_gibson.htm; Frances Clayton Gray and Yanick Rice Lamb, Born to Win: The Authorized Biography of Althea Gibson (Hoboken, N.J.: John Wiley & Sons, Inc., 2004).